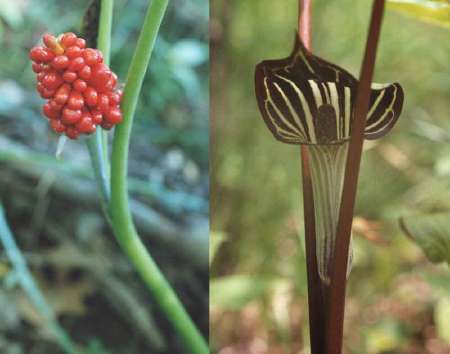 Jack-in-the-pulpit blooms in springtime in Westborough, right, and its red berries appear in late summer, left. Does Westborough have a distinctive natural feature? If a visitor asked you this question, how would you answer? Some towns have mountains, cliffs, ocean beaches, deserts, caves, a waterfall, or a view. What do we have? Swamps. Westborough is situated among swamps. Most of us don't think about the swamps very often, perhaps because they're largely inaccessible, except in winter when they're frozen. But they're there--some might even say everywhere. Almost everybody knows about Cedar Swamp, our largest and most central swamp. It dominates the center of town, whether we realize it or not. It fills much of the area between Flanders Road, East Main Street, and South Street/Route 135. But besides Cedar Swamp, Westborough has four other major swamps. They include Orchard Swamp (just north of parts of Route 9), Crane Swamp (on the border with Northborough), Assabet Swamp (near Mill Pond, which now covers land that was once part of it), and a nameless swamp around the outflow from Hoccomocco (south and north of parts of Route 9). Together, the five swamps make up 12 percent of Westborough--about one eighth of the town. In earlier days, they occupied even more land. Over time, some parts of the swamps have been filled for farmland, businesses along Route 9, and even portions of downtown. Other parts have been turned into a pond for flood control (Mill Pond). Westborough's swamps have regional importance, contributing to the headwaters of the Assabet River and the Sudbury River. Both of these rivers originate in Westborough. They merge in Concord to form the Concord River. The swamps are valuable wetland ecosystems that benefit our water table and foster biodiversity. They are a bountiful home to many varieties of mammals, birds, amphibians, insects, and plants. Migratory birds use them as stopping-places. In a place like Westborough, you don't actually have to walk out into one of the swamps to discover some of what is special in them. For example, jack-in-the-pulpit (Arisaema triphyllum ) is an unusual plant that is common at the edges of swamps and also grows in damp places in the woods and along stream banks. You can even find it growing wild in backyards downtown. Jack-in-the-pulpit is named for its resemblance to an old-fashioned pulpit with a "preacher" inside. The pulpit is striped with brown or green. Three large green leaves shelter the pulpit. The plants stand one to two feet high. Late May and early June are good times to see jack-in-the pulpit in bloom. If there isn't one in the woods behind your house, look for this plant in wet places where its relative, skunk cabbage, grows. A second opportunity to enjoy jack-in-the-pulpit comes in late summer, when its clusters of berries ripen to scarlet. (Don't eat them.) They're not hard to spot in the still-green woods, about a month before the autumn leaves turn. From the human perspective, jack-in the-pulpit might be considered a bit of a gender-bender. In a plant's first few years, most of its tiny flowers (clustered on the club-shaped "preacher") are pollen-producing male flowers. A few years later, when the plant is larger and stronger and has more resources to devote to seed-bearing, a change takes place. It now produces mostly female flowers. This mature plant develops the bright red berries in late summer. Finally, in a jack-in-the-pulpit's declining years, another change occurs. The plant switches back to producing mostly male flowers. For Native Americans, jack-in-the-pulpit was part of the bounty of the swamps and woods. For this reason, it has also been called Indian turnip. It offered food and medicine, though not without some work. The raw root is caustic, but Native Americans developed ways of processing it, primarily through drying, so it could be eaten or used in powdered form as a medicine. They used it to treat colds, coughs, and other respiratory ailments.